During the past month I have encountered the Pacific Gopher snake (video) three times while hiking or running on the fire roads and single-track trails near my house. Each sighting was in a different location. The second and third snakes appeared at least one mile or more from the previous sighting so they were probably three different individuals. The Pacific Gopher is very common snake in California. Most active during the day, it will hunt on very warm evenings. Its prey includes small mammals, lizards, other snakes and birds. Birds? Yes, the Gopher snake can climb trees. I once witnessed one drop casually from a low hanging tree limb onto the ground. Some snake species, the Striped Racer for example, can move so fast that it can be difficult to identify them. The Gopher snake is slower moving, taking a relatively leisurely pace for a snake. 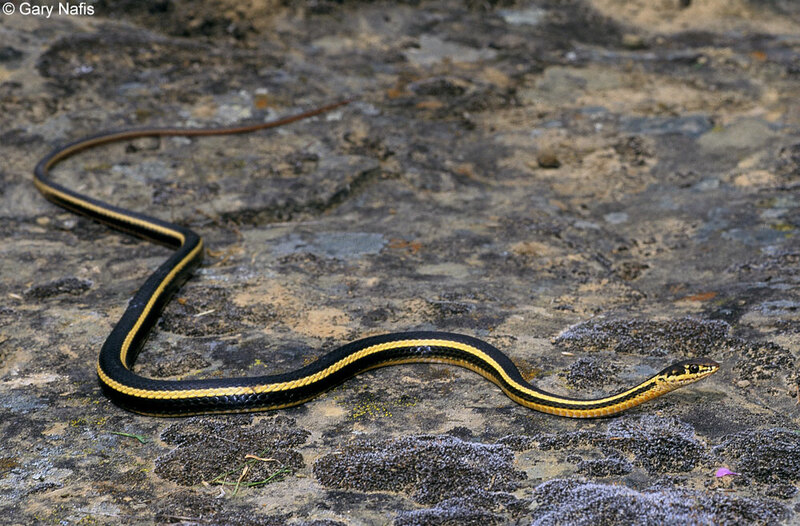 The one Striped Racer I have spotted so far was so quick to slide down a bank into the safety of a tangle of sage beside the trail that I only had a second to see the second half of its slender black form with horizontal yellow stripes. Any snake encountered on the trail (or off-trail) is a resident of the natural world around us and should be given plenty of space and respect. Other common snakes found on the trails include the Western Rattlesnake, Kingsnake and Striped Racer. These snakes have evolved within and are perfectly adapted to southern California’s Mediterranean ecosystem. The particular misfortune of the Gopher snake is that humans often do not know the difference between the Gopher and a Western Rattlesnake. The easiest way to tell the difference is head shape. The head of a rattlesnake is triangular while the head of the Gopher is slightly oval and slim by comparison. Many people have an aversion bordering on phobia to snakes. This phobia is something that I have been thinking about lately, probably because I do not seem to possess it. I do have a fear of rattlesnakes in the sense that I do not want to accidentally stumble upon one, or find one taking up residence in my house, or get within striking distance (half the length of the snake itself), but that seems rational; a bite is not only painful, it can be life-threatening. What puzzles me is when there is a fear of or extreme aversion to all snakes, including those that are non-venomous. Maybe it depends upon one’s familiarity with different snakes species, that is, being able to identify a snake when encountered, or simply knowing the physiological differences, e.g., the shape and width of head, between a venomous and non-venomous snake. It could also be due to to something known as an epigenetic rule. Epigenetic rules, refer to “…genetically based neural wiring that merely predisposes the brain to favor certain types of action.” Following this theory, humans may be predisposed to certain genetic instincts, such as a fear of snakes, although that instinct may remain unexpressed, as in my case.